Oil change is a term that harkens back to the bygone era of simple cars that were easy to work on, even in one’s garage. Modern cars are high performance, computerized vehicles, and require a different approach to maintenance. 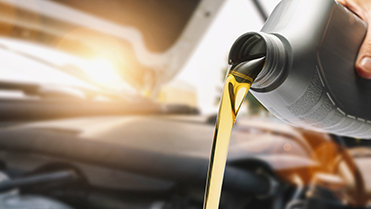 That’s why at Fremont Auto Center we do not offer a regular oil change anymore – we offer an oil service, which is much more comprehensive, and we only use full synthetic oil. In the olden days, before the era of synthetic oils, industry recommended oil change every 3,000 miles, because organic oils start to break down after about 3,000 miles. So a typical Bay Area vehicle would be seen by a mechanic 3-4 times a year. Today, fully synthetic oils allow cars to go 7,500 miles, even 10,000 miles without an oil change. As a result, your vehicle is rarely seen by a professional – developing problems that previously would be spotted by your mechanic can now go unnoticed for months. To prevent that from happening, when you bring your vehicle to Fremont Auto Center, we not only change the oil and oil filter, we also perform an inspection of other subsystems of your car. We inspect the tires, and inflate them to manufacturer’s specification (underinflated tires decrease gas mileage and increase tire wear), we rotate tires – this evens out tire wear which improves handling and mileage. 3) Issues that will need to be addressed at a future date – we will monitor them for you, as you bring your vehicle for oil service. So next time your vehicle indicates it needs service, bring it to Fremont Auto Center – we are happy to be of service. Making an appointment is easy – you can do so online, or simply give us a call.